Foot dynamics or biomechanics deals with the foot in motion. As such, it is a complex phenomenon that has to propel the body and in effect prevent it from falling forward. The foot must adapt to the surface and compensate with change to allow the human being to walk in a straight line. There are variations in foot dynamics during the gait, and many activities that form a complex series of motions, when abnormal, lead to a pathologic change. No two feet are exactly the same in terms of anatomy and morphology. Neither are the rules of biomechanics the same for all feet, thus adding another means of forensic evaluation. The dynamic foot, in addition to providing a base of support during a walking cycle, must be able to adapt to uneven terrain during initial contact with the ground and then change to a more rigid lever for push off. The gait cycle is a complex activity involving two phases. The stance phase accounts for 62% of the cycle and occurs when the foot is in contact with the ground; this includes heel contact, mid-stance, and propulsion (8). The swing phase accounts for 38% and occurs when the foot is swinging through to recontact the ground (8). 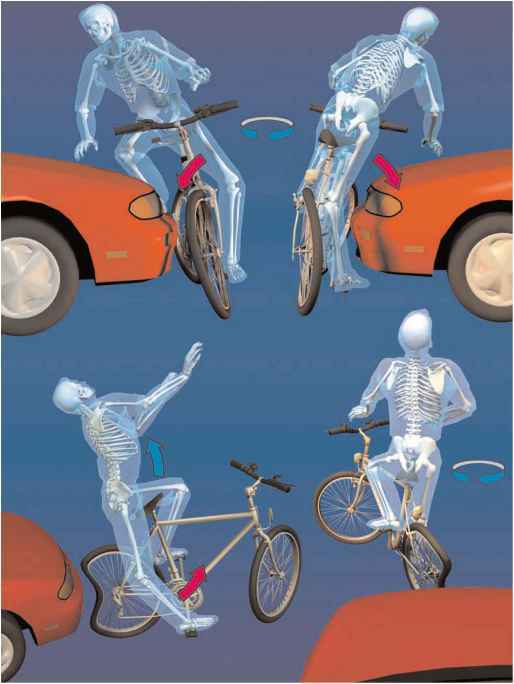 Forensic considerations of the gait cycle relative to pedal evidence will be discussed later in this chapter. We may classify the foot according to its morphologic appearance, as previously discussed. But how do we classify the functioning foot in biomechanical terms? Foot biomechanics is the application of mechanical laws to living structures, specifically the locomotor system of the human body. It pertains to the alignment of the rearfoot with the forefoot. This classification is based on the relationship between the standing calcaneal position and the nonweight forefoot-to-rearfoot position. It is logical in its approach and aims to be as objective as possible. The foot is characterized in four levels of cavus, a rectus foot (which is neutral), and four levels of planus. This classification system begins with type 1, with an inverted calcaneus and an everted forefoot (valgus). This is the most severe cavus deformity and is often considered the classic Pes Cavo-Varus deformity or claw foot. Types two, three, and four represent diminishing degrees of severity of varus. Type 5 is the neutral foot, with the calcaneus perpendicular to the weight-bearing surface and the forefoot perpendicular to the rear foot; it is considered the "normal" foot. The subtalar joint is the position from which maximal function can occur. Types 6, 7, and 8 are increasing in degree of valgus, with type 9 being the classic Pes-Planus deformity or severe flatfoot. Further discussion of these pathologic entities is beyond the scope of this chapter, and pertinent references in the bibliography should be consulted (10). Pathologic change that is seen with different biomechanical foot types is well known, and although there can be deviations from the norm, for the most part assumptions can be made with a good degree of accuracy. The patient with a planus foot often presents in clinical practice with a complaint of arch pain, heel pain, hallux abducto-valgus with bunion deformity, and hammer toe deformity. Other complaints may involve joints above the ankle level including the knee and hip joints. The patient with a cavus foot often presents with complaints of chronic lateral ankle instability, digital contracture, and metatarsophalangeal joint contracture, with increased declination of the metatarsal heads. Significant metatarsalgia with intractable plantar keratosis (deep, nucleated callus) formation may be a complaint in addition to medical concerns above the ankle. This biomechanical classification system with its inherent abnormalities in fact may lead to a better understanding of foot pathologies and how the complex system of dynamics influences pathologic entities. Entities known as subtalar or rearfoot varus or valgus deformity, forefoot varus or valgus deformity, and equinus deformity all may exist in a compensated or uncompensated form to some degree. Some of these entities are more common than others, but all may lead to an expected change in the footwear, gait pattern, or footprint. Therefore, without a keen knowledge of this subject matter, would be difficult to use in forensic contexts.